Aileen McClintock, Director, PRONI (left to right) and Sir Ken Bloomfield celebrate the launch of the new CAIN-PRONI online archives initiative, along with Dr Brendan Lynn, Deputy Director, CAIN, and Professor Gillian Robinson, Director, ARK, at the University of Ulster's Magee campus. A new online resource that gives the public access to recently declassified secret records from the early years of the ‘Troubles’ has been launched by the University of Ulster and the Public Record Office of Northern Ireland today. Staff from Ulster and the Public Record Office of Northern Ireland (PRONI) have worked together to make the records freely available on the University of Ulster’s CAIN (Conflict Archive on the INternet) website (http://cain.ulster.ac.uk/proni). The records cover a broad range of issues including security, politics and education. They comprise a selection of material for the period 1968-79 which is already in the public domain, having been published under the “30 year rule” – the time frame within which official documents are kept hidden from public gaze. The records provide a valuable online digital resource for researchers looking for information on the ‘Troubles’ and politics of Northern Ireland during this period. The new archive was officially launched by Sir Kenneth Bloomfield, a former head of the Northern Ireland Civil Service, at an event in the Great Hall, Magee. The records include part of the period when he was a senior government official. Dr Brendan Lynn, Deputy Director of CAIN, which is based at the Magee campus, said: “We have been delighted to cooperate with PRONI in order to add to and supplement the existing resources on CAIN. It has also allowed CAIN to pursue one of its long-term objectives of working with individuals, groups or organisations with relevant material to make digital versions of their materials more accessible to a wider audience. Aileen McClintock, Director of PRONI, said: “This resource provides researchers based anywhere in the world with direct access to some of the key documents held by PRONI relating to the Troubles. The aim of this pilot project, called ‘PRONI Records On CAIN’, was to make a limited selection of material released by PRONI under its ‘Annual Release Scheme’, available to a wider audience. This collection is the latest resource to be added to the continually expanding materials available on CAIN - the internationally recognised resource on the Northern Ireland ‘Troubles’. For further information contact Sinead Johnson, Press Officer, University of Ulster (028) 90368390 or the Communications Office, Department of Culture, Arts and Leisure, Tel (028) 9051 5047 or email: communications@dcalni.gov.ukThe CAIN website provides an extensive range of information and source material on the conflict and politics of Northern Ireland from 1968 to the present day. 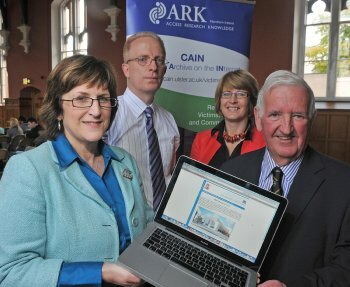 The site is used by a worldwide audience and has received over 14 million visits since it was launched in March 1997.CAIN is a component of ARK (Access Research Knowledge, http://www.ark.ac.uk/) a resource providing access to social and political material on Northern Ireland that inform social and political debate in the region and raises the profile of social science research. ARK is based within the University of Ulster and Queen’s University, Belfast, and is currently core funded by the Economic and Social Research Institute.The Economic and Social Research Council is the UK’s largest organisation for funding research on economic and social issues. It supports independent, high quality research which has an impact on business, the public sector and the third sector. The ESRC’s planned total expenditure in 2009/10 is £204 million. At any one time the ESRC supports over 4,000 researchers and postgraduate students in academic institutions and independent research institutes. More at http://www.esrcsocietytoday.ac.ukThe Public Record Office of Northern Ireland (PRONI) is a division of the Department of Culture, Arts and Leisure, and is the official archive for Northern Ireland. It aims to identify and preserve records of historical, social and cultural importance and make them available for the information, education and enjoyment of the public.PRONI closed to the public at its Balmoral Avenue site on September 3, 2010 as it began moving 40 kilometres of archives to new premises at Titanic Quarter. The new state-of-the art building is due to open to the public in April 2011.